A beach party on a boat! The Beach Lady is the perfect vessel to go out with your friends and family for a memorable time. 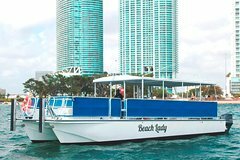 Departing from Bayside Marketplace in the Downtown Miami area, take advantage of the sights of Miami while cruising in Biscayne Bay. Splash in the water, enjoy yourself with the water toys that we can provide at no additional cost. There are plenty of water noodles, floating water mats, snorkeling gear and even a trampoline for your use! Soft drinks, Gatorade, waters and light snacks are always included for your refreshment. Be sure to remember to bring a towel and sunscreen, and don't forget your camera! Check in starts promptly at 10am in the Island Queen Cruises Kiosk located next to the main stage. Cruise will then depart at 10:30am, and there is a minimum of 5 passengers for trip to go out. Please be sure to contact the local supplier after purchasing to confirm your reservation due to the minimum passenger count.